In Color Order: Birthday Giveaway! Hello! This Spring marks seven years since I first started this blog! March is also my birthday month, so I thought it was a good excuse to hold a giveaway! 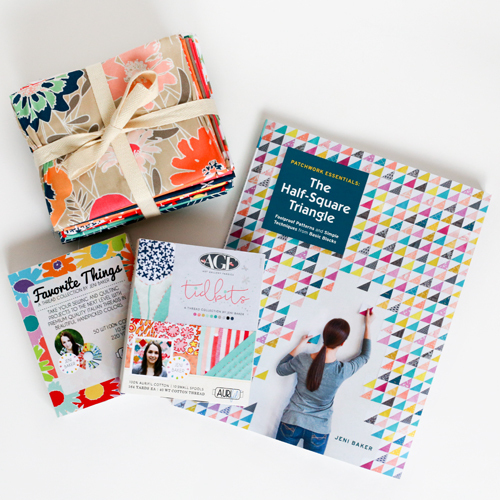 One lucky reader will win a signed copy of my book, Patchwork Essentials: The Half-Square Triangle, a fat quarter bundle of Curiosities, and a small boxes of each of my Aurifil thread collections, Tidbits and Favorite Things. To enter, please leave a comment telling me your favorite way to celebrate! One entry per person, international entries welcome. Giveaway will close Monday, March 21st at noon CST. Winner will be chosen at random. I'll update this post with the winner shortly thereafter. Giveaway is now closed. The winner is comment #560, Michelle! Thank you for your readership over the years! My favorite way to celebrate is eating a good meal with my family! My favourite way the celebrate is a picknick! often combined with a nice walk. Have just recieved your book for mybirthday, love it have post it notes hanging out of it marking the quilts to make. I also got a new machine yeah. Love to hang out with my grown up kids on my special day. Jeni, I love to celebrate anything with cake. I have been following your blog since 2010 when I first discovered blogs. I love that sweet George is part of your blog too. Congratulations on 7 wonderful years. Since I have a young son, all that is needed to celebrate a birthday is cake! My favorite way to celebrate would be dinner with family, either going out or someone else does the cooking! I celebrated my birthday earlier this month with a three day quilt retreat! Many thanks for the opportunity.. I love private celebrations... Whenever we have an occasion to celebrate, we usually book a nice restaurant and end it with a lovely cake at home... Happy birthday! My favorite way to celebrate is dinner and a cocktail. Wow what a super giveaway. And happy birthday month. Hmmmm best way to celebrate....well I'm a HUGE sucker for Mexican Food. so a celebration usually consists of us making a 2 hour drive to our all time favorite Mexican in Folly Beach, Taco Boys.. Best chips and salsa and best margaritas :) tell you the truth we just celebrated on Monday... We celebrated it being 80 degrees. LOL thank you again! Happy Birthday! My birthday is also in March! 👊🏼 You can never go wrong with a beachy weekend getaway!! Thanks for the chance to win! I love celebrating birthdays and other special days with my friends with a good meal and lot of fun. Talking or playing games are one of our favorites. Thanks for the chance and a double happy Birthday! I celebrate with my family by going out for dinner. No cooking! No dishes! My favorite way to celebrate is dinner with family and friends. There's no celebration without cake! My favorite way to celebrate is with family, chocolate and maybe, just maybe a glass of wine. Congrats and happy birthday! Happy birthday and blog birthday! With a summer birthday, ice cream all around is a must for my celebration! Congratulations on your book and fabric lines! I always celebrate with cake! I'll use any excuse to eat sweets :) happy birthday! Simple stuff, dinner out somewhere. Quiet sewing time. Thanks for the giveaway! I celebrate spring with some long walks and also some spring cleaning. I bought a copy of your book for my daughter, but would love to win a copy for me! It's going to sound silly. Either high tea or cake and mini-golf. I never get to do either activity, so I really appreciate it when I can. Happy Birthday to us! March is my birthday month too. My favorite celebration is a relaxed meal out with family and friends...and it usually involves a glass of wine! Happy birthday! I am a march baby too and I always feel a special affinity with other Marchies. I don't like big groups so my preferred way to celebrate is a series of smaller events - a birthday festival. Although it is hard to beat a nice dinner and a cocktail. I love your blog - it was one of the very first ones I started following. Congratulations on all you have achieved!! Happy Birthdays! My birthday is next week. Looking forward to going out to eat at my favorite restaurant and eating dessert! Happy Birthday on both accounts! Thank you for sharing on YOUR month to celebrate! I prefer to celebrate with a quite dinner at home. I like to celebrate with family and friends. My birthday falls on New Year's Eve, so when I celebrate, the whole world is celebrating with me. At the New Year's countdown, when everyone else says "Happy New Year", I say "It's not my birthday!". I like to celebrate with a nice dinner out, some thing that feels like a splurge. Birthdays are a wonderful time and I love to celebrate them. I always try to call the person with the celebration, if they are far away. I love sending gifts and cards, which I try to get that are individually picked. If I am hosting a party, we have to have cake and ice cream. Happy Birthday!! I just celebrated my 70th birthday by going to QuiltCon and I'm already planning my 71st celebration trip to QuiltCon in Savannah next year. I know how to live, don't I? I celebrate by spending time with my favorite people! Some years it's just my husband, some years it's a group of friends at dinner...good people make all the difference! Celebrations at our house almost always involve scavenger hunts! My favorite way to celebrate is a quiet dinner out - one I do not have to prepare!! My favorite way to celebrate is a low-key evening at home with my family! I like to celebrate by going out to dinner, which is a rarity with three kids! Happy birthday! Since moving here in June last year, a day at the beach and phone calls from my boys! Thanks for the great giveaway!! Happy Birthday!!! I celebrate my B-day eating - usually Italian food then home made chocolate cake with vanilla frosting. This is a great contest, thanks for the opportunity! Have a great day! Happy Birthday! I like to celebrate by doing something nice for myself. My birthday is coming up at the beginning of April and all I can think about already is chocolate cake! My birthday is in the fall so a nice walk in the woods with the family to see the changing colors is always fun if the weather cooperates. Follow that with a good meal and a good movie , best day ever. My family and my ex-husband didn't do much celebrating so I still have to work to build habits around this. With my daughter we celebrate by eating special foods and including fancy napkins and beeswax candles. For her birthday I started a tradition of leaving her presents, all wrapped in coordinating papers and ribbons, on the dining room table for her to see in the morning. I like to celebrate by visiting some place new. March is my all time favorite month. My oldest son was born on St. Patrick's Day and yes, his name is Patrick. He had another name but I changed it at the last minute. So celebrating with green is big to us during this month! I celebrate by reading books and watching movies. Sometimes, I go shopping! Happy Birthday to you! I love your blog. happy birthday to you and the blog!! i like to celebrate my birthday by throwing a brunch and inviting my friends over. my husband and i love to feed people. :) other occasions get celebrated by special dinners, or maybe a splurge purchase...and with fabric! always up for an excuse to browse and buy some fabric. thanks for the generous giveaway! Favorite way to celebrate - a good meal, a great dessert, lots of laughs, good music, and many loved ones. Happy birthday! And happy spring! Happy Birthday! Sitting on the porch with my husband! I like to celebrate with my friends and family playing board games! I like to celebrate by buying myself a present, usually craft supplies! And cake too! Happy birthday to you and your blog!! What a great giveaway! My birthday is in July so my favorite way to celebrate is by heading up to the lake for an afternoon of boating! Hope you get the chance to do something fun! Congratulations and Happy Birthday! My favorite way to celebrate is hanging out with my family -- we have such fun together! Happy Birthday! I like to celebrate with a day at the beach and then cuddling up with my husband for movie night. I love your Curiosities fabric line - the fireflies are my favorite! Thanks for the opportunity to win awesome prizes! My favorite way to celebrate is eating out and a yummy treat!!! Happy birthdays!! I like to go out to eat. And have cake at home. I like to celebrate by getting together will my family. We are pretty big, so it's definitely the more the merrier. Congrats and thanks for the chance to win! I love to share a special meal with those I love to celebrate. Happy bday & blog anniversary! I like to celebrate over food with good friends! Happy Birthday! My favorite way to celebrate my birthday is a trip to Destin, FL, sit on the beach, watch the waves crash in, hold the hand of my wonderful husband and RELAX! My favorite way to celebrate is with friends and food! And if I'm in a quiet mood - then reading or quilting! Wahoo! Happy Blog Celebration! Wow seven years is huge! I celebrate with friends! And buying fabric! And sneaking off to the sewing room to consume chocolate! I love to celebrate with my closest friends with food & fun , could be just good conversation, movie, bowling , or a small trip. Happy birthday month to you & thanks for seven years of sharing your inspirations. Happy Birthday and Blogaversary! I so enjoy your blog.... quilting with friends is an awesome way to celebrate anything I think! Happy birthday!! I like to celebrate birthdays with a brunch or BBQ. I'm all for a small get together with family and good friends. Happy birthday!!! My way to celebrate? Dancing and shopping for fabric!!! Well we usually go out to eat and the fam does a cake! Happy B-day! Congrats! Happy Birthday! I love to celebrate with the people I love, and of course, with cake! For my birthday I Make up Love Tokens for my quilting group. All celebrations need a cake! :) Congrats! I celebrate by spending a festive day with my family and leaving plenty of time to sew! I like to celebrate with friends and family. Happy Birthday! My favorite way to celebrate is with a drink... or three. Congratulations. My favorite way to celebrate is anything outdoors with trees or views. My favorite way to celebrate is dinner with my family, preferably something I don't have to cook. Happy Birthday! My favorite way to celebrate is by enjoying a good meal with my favorite people. maybe followed by some sewing! I would celebrate with flowers :-) Congratulations! I love to celebrate with my family. They get to make me my favorite meal that day. Thanks for the chance to win! Happy Birthday! I love going to a cupcake shop, then doing some window shopping and then finished with some me time - whether that's a run, a bath, or some sewing time! My most favorite way to celebrate is to have my whole family near and have a nice meal with them. With friends and family and food! Birthday or other holiday - that's what we do! I love to celebrate with a glass of champagne. My favorite way to celebrate my birthday is by taking a nice long hike followed by a nice hot shower & then some stitching. This is my birthday month too. Happy birthday to you! I like to spend the whole day as a "me" day. This usually involves hanging out at home and then a bit of shopping for books, magazines, clothes, and fabric. Sometimes it is mainly window shopping, but usually sometime in the month I treat myself to something special. My favorite is a quilting workshop or a retreat. Great giveaway! I love being on a trip to celebrate! Seeing or doing something different and new. Congratulations and thanks for the giveaway! Happy birthday! March is a big month for birthdays in our family (mines's in March, too! ), and we celebrate by getting the entire family together for a great home cooked meal and (of course) cake and presents. I like to make the celebrated one's favorite meal. Happy Birthday Jeni!! And happy 7 years on your blog! One of the first I started reading, and still one of my faves :) As long as there is a cake somewhere in my day, I'm good :) Thanks for an super sweet giveaway!!! i like to celebrate with good friends, good food and of course good cake! My favorite way to celebrate anything is with my family (blood and friends who are like family) surrounding me...along with good food and drink. Can't be beat! Thanks for the chance to win! My favorite way to celebrate a birthday is with a big chocolate cake. Enjoy your blog-a-versary. Thanks for the opportunity of such an awesome giveaway! I like to celebrate by eating at a local hamburger joint and eating ice cream cake!! What a great giveaway! Happy birthday and blogiversary. Thank you for the chance to win. My favorite way to celebrate is to treat myself with something special - either a decadent dessert, or a splurge purchase of something I don't "need" like fabric. My favorite way to celebrate is to go out to dinner with my family, preferably to a place with waterfront dining. A toast with a special beer and a relaxing evening together making plans for our next adventure together. Or in lieu of that buying a bundle of super cool fabric! Happy Blog anniversary! Next week will be my 8th blog anniversary. Amazing how fast it goes and how much we have accomplished, huh? I like to celebrate by being with good friends or sometimes just being alone and creating something while wearing my pajamas all day long! Unlike every other selfless day of the year, your birthday is the one day a year you are allowed to be truly selfish. "Go get me a drink of water?" shall be met with a drink of water. Oh and cake, always cake. My favorite way to celebrate would be dinner out with the family and an evening with me and my sewing machine! Treating myself to something special, sharing a meal with my family and of course some fantastical dessert. I like to do something or go somewhere that that I've never done or gone before! And I'm not talking about bungee jumping or anything like that! I think the best way to celebrate is quilt shopping, winning quilt things and sharing it with friends. Family, friends, food & good wine or champagne!!! Congrats on 7 years, and happy birthday! My fave way to celebrate is with a good sleep in and then lots of yummy food all day!! I hope you have a very happy birthday! This is such a generous and awesome giveaway :) As long as I'm with family or friends, it's a good day. But I do have to have white cake with buttercream frosting! Chocolate cake is the best way to celebrate! Happy birthday to you! I loved your columns in Love Patchwork and Quilting. My favorite way to celebrate, is to treat myself something special, whether it's a good meal, a movie, an outfit, some fabric, a book or a new lipstick. Congratulations on 7 years and a very happy birthday! My favorite way to celebrate is having a gathering of family and friends (preferably outdoors when it's warm!) and watching my daughter play and enjoy the day. Snacks, conversations, no rules, just fun and good company!! Spending time with my family which usually includes dinner. And cake! There has to be cake! My favorite way to celebrate is dinner with my family. Happy birthday Jeni! Celebrate Spring with some Rita's Water Ice--any other time it's chocolate cake for the win. Congrats on 7 years and March is really a great birthday month! I celebrate by taking the day off usually to do whatever I want- hiking, fabric shopping, sewing and/or ice cream trips! I love to celebrate over a good meal and, of course, cake! Happy birthday! My favorite way to celebrate is to pack a picnic and head into the woods for a good hike and time with nature. Happy Birthday to you and your blog! Many families use cake as their go-to celebration, but in my family we are all about the ice cream sundae party. Brownie ice cream sundae parties are the best! A few flavours of ice cream and a pile of toppings to choose from, such a fun way to celebrate a special occasion! Thanks for sharing, this bundle looks beyond perfect! I love to stay home and have a nice dinner then movie night on the couch with my husband and young son, all snuggled up under a quilt or two. Happy birthday Jeni! Today is my father's birthday. Happy Birthday dad! And March blogiversay and birthday to you. I love to celebrate with ice cream and cruises. I recently took a birthday cruise myself. I love to celebrate by having a dinner with my family, and maybe a date night with my husband. I would much rather spend time with him and our kids than anything else since we are always so busy with outside activities. My favorite way to celebrate is, of course, the traditional corned beef and cabbage! Wow, 7 years . . .that is amazing!!! I have enjoyed coming and reading about all your fabric adventures ;) I like to celebrate with good family and friends, which is why I can't wait to come and say hi at Market!!! I like to celebrate by being with my kids and their kids. Congrats and happy birthday. I love to spend a fun day with family and friends. as long as there is cake involved, I'm happy! Happy Birthday!! I'm also a March girl :) My favorite way to celebrate is by buying myself something nice! My three year old is pretty sure that all you need for a birthday is cake! Anytime we have cake he assumes it is someone's birthday. :) I personally like balloons for any birthday celebration, and flowers. I like to celebrate by buying myself a little 'something', often a quilting supply or fabric! I would love to celebrate with a vacation to Switzerland but realistically I'd love a day to do whatever I was feeling like doing at that time, maybe start the day with a haircut and style, oh and cupcakes from our local Cake Fetish...amazing!! :) love your fabrics and would love to win these! Thanks! I celebrate my birthday with a trip to the spa (massage and nails done) After that, anything goes! Love reading your blog. I have a birthday coming up on the 5th next month and my favorite way to celebrate it is to go out with my gal pal and have one nice glass of wine and dinner with a birthday dessert. We catch up on things and generally enjoy the girl time. It's quiet, which is my general preference, and gives me time to breathe because I know I can be myself with her and there's no judgment, no deadlines, no stress. It's just wonderful. Happy birthday to you! A celebration wouldn't be the same without family, friends and good food. Happy birthday. I hope you have the best day ever. Haha, margaritas are my favorite way to celebrate! I celebrate by buying myself something indulgent I really want! I like to celebrate with good friends and a glass of red wine. I love to celebrate with cake! the fancy kind with lots of layers and special frosting-- and candy on top doesn't hurt either.... I also like to celebrate with the inedible kind of layer cake too ;) Happy Birthday! I celebrate my birthday month of March, as well. One special thing I do with my daughters is we do a progressive birthday dinner at some favorite restaurants. Fun to plan and to do. Happy Birthday, I like to go out for a nice dinner with family and friends, and then have cake! I like to go somewhere...even for a walk someplace new or someplace we don't go very often. Poke around a different town. Stop for ice cream or lunch. I spend a lot of time at home, so an adventure out is my first choice. Congratulations! My favorite way to celebrate a special day is to be surrounded by family and dear friends, sharing lots of love, loads of laughter, and lengthy conversation! I love to eat delicious food and go shopping! We like to head over to one of our favorite parks to celebrate the spring equinox by walking the labyrinth with the master gardener and getting our first plant from them. Today I will celebrate St. Patrick's Day and My BIRTHDAY!!!! Fun, Family, Food, and perhaps a green beer are on my agenda for the day!!!!!!!! ps: guess I read the post wrong..I saw spring! LOL! Birthday's??? Meh..no more celebrating them. LOL! Happy birthday and happy anniversary! My favorite way to celebrate is having a nice meal with family and friends! I like to celebrate with a big soft chocolate chunk cookie, a good book, and some quiet downtime! there is no better way to celebrate than to gather with those who you love, be it family, friends, or new acquaintances and have a jolly good time - lots of laughter. Celebrate - a dinner with family. Not really a cke person, but I love good food and family. Jen, I'm so inspired by your work! I celebrate with champagne, usually! I love a tasty brunch with family. Happy Birthday! Happy Birthday! My birthday is also march and I like to celebrate with my family and friends with simple dinners. Celebrations are always best with family! A nice dinner, dessert, and cards or a board game. The best way to celebrate anything is a quiet dinner at home with my husband. Congrats on 7years!! I like to celebrate with the best family and a few good friends over for some grilled deliciousness and a little tequila! Happy birthday! My favorite way to celebrate is home with family. HAPPY BIRTHDAY TO YOU !!! My birthday is also in the month of March and wishing for a serger from hubby.